In the ship's mess hall, Captain Mercer presents Yaphit with a medal for bravery. During the celebration, he and Grayson are called down to take a call from Admiral Perry who informs them that the Krill have opened the path to negotiating peace. Mercer is tapped to begin the process. As they approach the Krill ship, a Krill shuttle is detected and when the Krill ship fire on it and a distress call comes through, requesting assistance, Mercer orders the shuttle bay doors be opened and the deflectors put up to protect the runaway. The shuttle crash lands in the bay and Grayson, Finn, and Malloy attend. The male pilot is unconscious but stable. The female passenger seems spooked by the medical scanner and tries to run. Malloy catches sight of the pilot's face when he's securing the console and recognizes him, calling him "Orin." The Krill captain demands the return of the male pilot, claiming he has destroyed four Krill ships during the time of the cease-fire and possesses a dangerous weapon. Grayson states that they have not found a weapon on the stolen shuttle. Mercer asks the delegation to come aboard as planned for further discussion. Mercer asks Keyali to stall the Krill so he can find information on the shuttle pilot. Malloy explains to Mercer that Orin and was his best friend and that he and his daughter were taken during a Krill attack twenty years ago. Orin awakes in sick bay and explains his daughter's mutism and fear of medical examination to Dr. Finn. Mercer and Malloy enter sick bay and after Orin and Malloy greet each other, Mercer explains the allegations levied by the Krill captain. Orin denies destroying any ships and explains that he didn't even know there was a cease-fire. 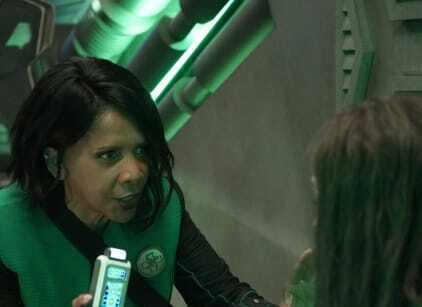 In the briefing room, the Krill delegation insists the Orville turn over Orin for interrogation. They are convinced he destroyed the Krill ships, killing 1200 Krill on board, although they don't know how he managed to do it. When Mercer tries to convince them to table the issue and focus on peace, the representative calls off the talks until Orin is turned over. Malloy and Orin are talking about Orin and his daughter, Layna's, experience in the Krill prison camp as well as Orin's late wife, Sophie. Malloy credits Orin for saving his life the day of the Krill attack. Orin believes that peace is not the way to deal with the Krill. Malloy tries to convince him it would give meaning to Sophie's death but that triggers his friend who thinks peace means the Union is forgiving the Krill their atrocities. In the mess hall, Grayson and Keyali show Layna a musical instrument from Xelaya. Mercer speaks with Keyali about her sense of Orin. She can't see how he could've done what the Krill claim he did but she doesn't trust him either. Orin looks around the Engineering Department. Keyali finds him poking around the storage space and asks him if he was looking for something. Mercer and Grayson contact Admiral Perry and he explains that the Planetary Union is considering extraditing Orin to the Krill. Malloy is showing Layna the original "Planet of the Apes" film when Mercer comes into his quarters. When Mercer asks him about Orin, Malloy becomes defensive and takes Orin's side on the peace issue. Malloy brings Layna back to Orin and asks Orin if he broke the cease-fire. Orin insists that Malloy help him steal a shuttle so he can stop the peace talks. He leverages the twenty years he spent in the prison camp to guilt Malloy into complying. LaMarr notices two missing quantum plasma containers but there's no missing quantum plasma. The captain posits that plasma could be weaponized. Keyali asserts that there were no weapons aboard the shuttle or Orin or Layna but agrees to do another sweep. The bridge team can't figure out why Orin would take empty canisters. Malloy is nervous. Malloy comes to Keyali and proposes they have a drink. He confesses to Keyali that Orin asked him to steal a shuttle. He tells her that he'll tell Mercer. He goes to Orin's quarters and indicates he's ready to help him. In the shuttle bay, Keyali confronts them. Malloy shoots her. They steal the shuttle. On the bridge, Bortus indicates that the tracking device is operating. Keyali recovers and goes to check on Layna. On the shuttle, Orin won't share his plan with Malloy and tells him to chart a course to rendezvous with the Krill ship. When Keyali goes to see Layna, she notices wounds on her forearm. When she calls for Dr. Finn to come to the quarters, Layna suddenly pulls a knife on her and demands she belay her order. Not knowing about Xelayan strength, Layna is taken by surprise when Keyali flings her across the room. Dr. Finn comes in at that moment and spots Layna's strangely colored blood. She order Keyali to clear the room and lock the door. She contacts the bridge to put a forcefield around the quarters and enact a nitrogen purge. On the bridge, she explains that the woman they had thought was Layna, Orin's daughter, is an Envall, a species of humanoid with blood that reacts violently with nitrogen. Orin has been using her blood to blow up ships. The bridge crew realize that he plans on doing it to the ambassadorial ship, only this time, it's a suicide mission. The Orville rushes to intercept the shuttle. On the shuttle, Malloy demands Orin explain the plan. Orin pulls out the plasma containers filled with Envall blood. He explains that Layna's been dead twenty years, since the attack. The woman he travels with hates the Krill for her own reasons and when they met at an outpost, they joined forces. Malloy turns on him in light of the truth and they struggle. Orin activates the canister. Malloy shoots out the nav console so he can't set the course to the Krill ship. Malloy tries to convince him to abandon ship with him by donning a space suit. Orin refuses. Malloy steps out of the airlock just as the shuttle explodes. He is thrown out into space but is picked up by the Orville's tractor beam and saved. The peace talks are successful. In his quarters, Malloy mourns his friend. Mercer visits and clears the air.